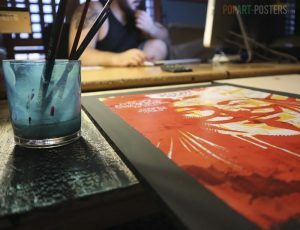 With Popart-posters.com you’re bringing home an unique and limited edition work of art! 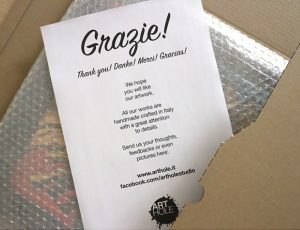 All the artworks in our catalog are made in exclusive collaboration with Arthole.it, an Italian digital artist appreciated on many famous marketplaces, in Europe and USA! 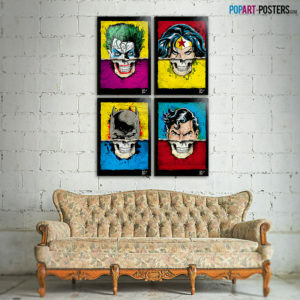 The subjects are all original, inspired by comics and cult films of the 80s, 90s and 2000s, made with mixed technique and improved by hand, offering you an unique and inimitable handmade pop-art product. The cult movies, cartoon characters and comics that have marked your life are all here. The subjects are reworked in a distinctive pop-art style, full of bright and vivid colors, on a 1 cm (0,40 inches) wooden support that does not require a frame and can be immediately attached to the wall thanks to the hook provided. The 35×50 cm (13,8 x 19,70 inches) format is large enough to turn a wall into a stunning personal art gallery. And if there is still space, you can combine multiple paintings! A small work of art that can also become a great gift! Art is even more satisfying, if it can be shared! Our paintings can also become a splendid and original gift, to give to those you care. And in addition, the work can be customized: on the back you can write a dedication, which we will print for you! Artworks are all carefully shipped with a custom safety box, to ensure you will receive it “safe and sound”… everywhere you are! Still have questions or doubts about our products? We’ll be glad to hear from you!